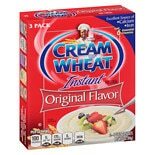 Shop Cream of Wheat Hot Cereal Original (3 oz. )3 oz. 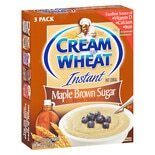 Shop Cream of Wheat Hot Cereal Maple Brown Sugar (3 oz. )3 oz. 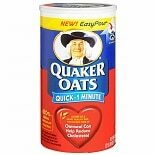 Shop Quaker Quick-1 Minute Oatmeal (18 oz. )18 oz. $349$3 and 49 cents$0.19 / oz. 2 for 7 dollars and 00 cents or 1 for 3 dollars and 99 cents 2/$7.00 or 1/$3.99$0.03 / oz. 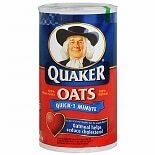 Shop Quaker Quick-1 Minute Oatmeal (42 oz. )42 oz. 2 for 7 dollars and 00 cents or 1 for 3 dollars and 99 cents 2/$7.00 or 1/$3.99$0.27 / oz. 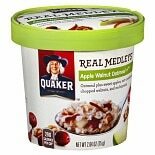 Shop Quaker Real Medleys Oatmeal Apple Walnut (2.64 oz. )2.64 oz. 3 for 5 dollars and 00 cents or 1 for 1 dollars and 99 cents 3/$5.00 or 1/$1.99$0.75 / oz. Whether you enjoy a hot breakfast to warm you up in colder months or prefer hot cereals for their nutritional value, they can be a great way to start your day. Many of these breakfast cereals contain a high amount of fiber that can go a long way toward making you feel full and satisfied throughout the morning. 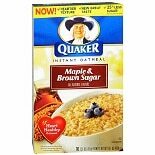 Browse different flavors and types of hot cereals from brands such as Bob's Red Mill, Quaker and Deerfield Farms here at Walgreens.com. The various types of hot cereals are made from different grains such as oats, wheat and rice. 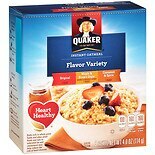 You can find whole grain hot cereals that are ideal for heart health and offer other nutritional benefits. If you need a warm breakfast that is fast, easy and mess-free to make, choose from different types of instant hot cereal that you can microwave or mix with hot water. Some hot breakfast cereals are flavored, while others are ideal for serving with sliced fruits or berries. 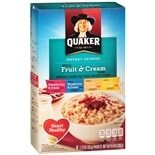 In addition to hot cereals, you can find other breakfast foods among our selection of pantry items. Cold cereals and granola are available to add a little variety to your morning routine, as well as mixes for making pancakes and pastries. For nutrition on the go, choose from different types of instant breakfast drinks and cereal bars.